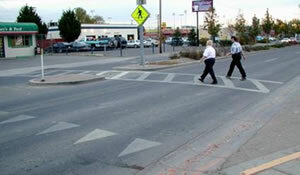 In-pavement flashers at crosswalks are also an option that can be considered. Crosswalks with in-roadway warning lights, also referred to as ‘flashing crosswalks’, may be used to further alert drivers to crosswalks and hopefully enhance the safety of children crossing the street. Lighted crosswalks consist of a series of lights that are embedded into the pavement along the crosswalk lines that are activated when a pedestrian pushes a button or starts walking into the crosswalk. As with any traffic control devices, they have certain advantages and disadvantages. A 2009 review of literature on in-pavement flashing lights may be found on the Pedestrian and Bicycle Information Center's Web site. For more information on case studies related to in-roadway warning lights visit 2004 PEDSAFE "School Zone Improvements" Cupertino, California case study. Evaluations of use of in-roadway warning lights are available from Washington and Florida. Yield lines and set-back stop lines in advance of crosswalks improve a driver’s view of the pedestrian in the crosswalk, reduce the number of motor vehicles encroaching on the crosswalk, and indicate that motorists should yield to pedestrians in advance of crosswalks. Stop lines are used in advance of marked crosswalks at signalized intersections, while yield lines are placed in advance of unsignalized crosswalks. This image illustrates a multiple-threat collision. A clear and simple marked crosswalk with set-back yield markings placed well in advance of the crosswalk can reduce the chance of a multiple-threat collision. A multiple-threat collision is a pedestrian crash type that occurs when pedestrians have to cross more than one lane in each direction. 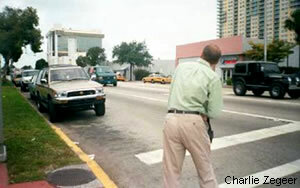 A motor vehicle in one lane stops and provides a visual screen to the motorist in the adjacent lane. The motorist in the adjacent lane continues to move and hits the pedestrian. Painted triangles (shark’s teeth) are used as the yield line at unsignalized locations. A line of painted triangles, also referred to as “shark’s teeth” yield markings are appropriate for use as the yield line at unsignalized locations, as per the MUTCD 2003 Edition.Some state laws call for the placement of lines 30 to 50 feet prior to crosswalks at unsignalized locations. This distance is far enough away to provide for improved sight distance in the adjacent lanes. If the bars are placed more than 50 feet away, motorists are more likely to ignore the line and stop only a few feet prior to the crosswalk. Advance stop lines at midblock signals can help improve the visibility of that signal as motorists may not expect to stop at a midblock traffic signal. Advance stop lines at signals results in the need for longer change intervals for motorists (yellow plus all-red times). 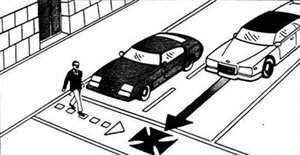 Problem: Car 1 stops to let pedestrian cross; car 1 masks car 2, obstructing the pedestrian’s and car 2’s view of one another. Car 2 doesn’t stop and may hit the pedestrian at a high rate of speed. Solution: place advance stop/yield line so car 1 stops further back; car 1 no longer masks car 2, which can better see and be seen by the pedestrian. Removing parking from corners can improve visibility between pedestrians and approaching motorists. Restricting parking at corners will improve visibility of the crossing for both drivers and pedestrians. At a minimum, 30 feet should be kept clear in advance of marked crosswalks to help pedestrians and drivers see each other better. Distances greater than 30 feet are generally better, but parking restrictions have to be balanced with the need of the motorist. For example, if parent parking is severely restricted or completely removed near schools, parents may ignore all parking restrictions. Restricting how close motor vehicles may park to a crosswalk (20 foot minimum per MUTCD) to improve pedestrian and motorist sight distance. Eliminating parking spaces too close to a crosswalk will improve pedestrian and motor vehicle visibility, which can reduce the likelihood of pedestrian-vehicle conflicts and collisions. Costs involve new street markings, signs, enforcement and public education efforts. Roadway reconstruction issues may also affect the overall cost (NCHRP Report 500, Volume 10, 2004). Accurately identifying problem locations and appropriate improvements. Educating the public about the purpose of proposed improvements. Potentially strong resistance to the loss of parking spaces by business owners and local residents, especially in areas with limited parking. Number of crossing pedestrian crashes.